Making a cute card with some sparkle is so easy! I stamped the Hoppy Easter bunny with Whisper ink then colored in the ears, nose and tail with Stardust Glitz Glitter Gel. The egg has some Green Glitz Glitter Gel and the pink bands were colored with markers. 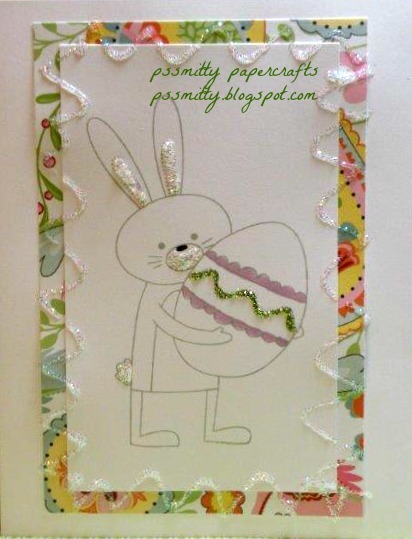 The colorful print B&T from the Chantilly paper pack makes a perfect mount for the bunny. When everything is adhered to the card front just add a few squiggles of Stardust Glitz to complete the pretty sparkle border!